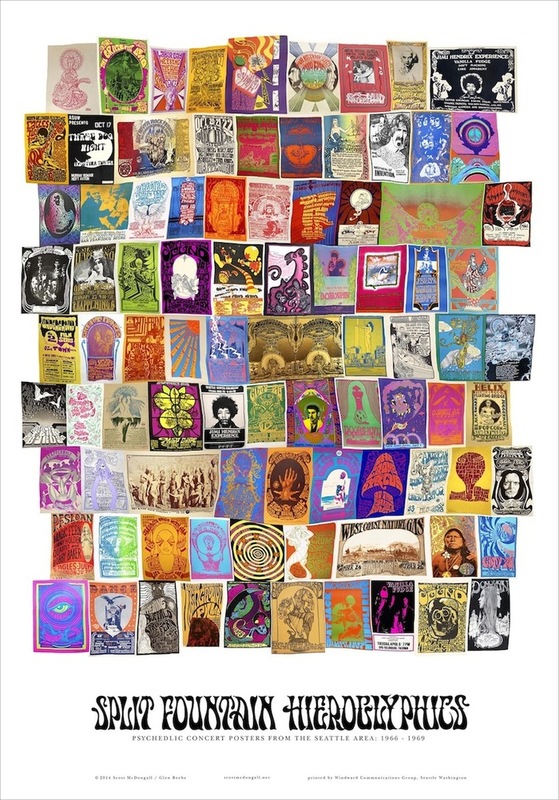 This limited edition book features the psychedelic concert posters from the Seattle area that were produced in the 1960’s. Split Fountain Hieroglyphics will be a hardbound book, signed and numbered with a limited edition of 1,000 to 2,000. This volume will be (approximately) 9”x12” and at least 150 pages. 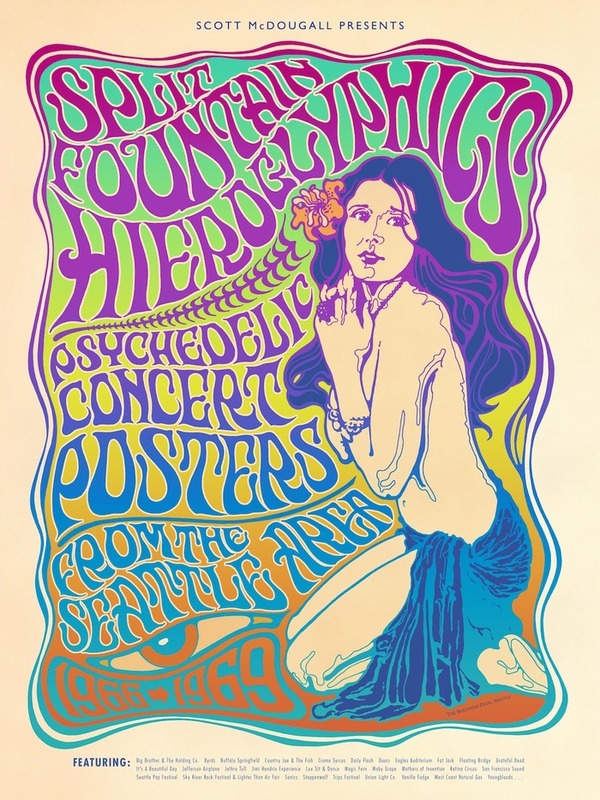 Illustrated in full color, this volume will follow the rise and demise of the psychedelic concert poster in the Seattle area from 1966-1969. Since these posters were made as disposable advertising, very few have survived. Scott McDougall has been photographing these pieces in various private and museum collections for over 20 years with an eventual book in mind. The majority of this body of work has not been documented until now. 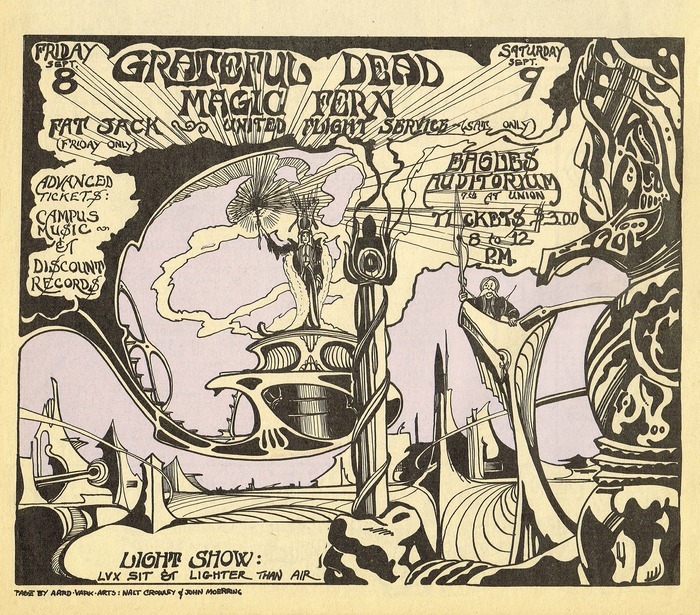 In addition to the individual poster artists, approximately 200 different performers and groups as well as the local venues and light shows will be indexed to the illustrations. Part of the project appeal for Scott is to have the book produced in Seattle with the printer he has done numerous projects together with over the past 15 years or so that have included many posters along with catalogues and CD covers. The funding goal is entirely based on printing of the book and rewards, bindery, shipping and related expenses. Additional reward items are from Scott’s personal collection. At this time, all of the design work, photography, writing and research have been a labor of his love. JT Lucchesi liked this on Facebook. Andrew O’Beirne liked this on Facebook. Paz Patel liked this on Facebook. Marc Parry liked this on Facebook. Gary L Jackson liked this on Facebook. Matías Fiori liked this on Facebook. Debbie Perozzi liked this on Facebook. Herb Schecter liked this on Facebook. Demerie Queen liked this on Facebook. Michele Tummino liked this on Facebook. Christian Gerike liked this on Facebook. Corvo Nero liked this on Facebook. Graham MacKenzie liked this on Facebook. Jason Wilson liked this on Facebook. Bridget Holland liked this on Facebook. Kathy Eagle liked this on Facebook. Sam Cerenov liked this on Facebook. Gustavo Henrique Fleiuss Calvet liked this on Facebook. Jean-Pierre Moya liked this on Facebook. Olga Pantou liked this on Facebook. Rod MacLeod liked this on Facebook. Sue Chesnut liked this on Facebook. Jon Tyrrell liked this on Facebook. Larry Shank liked this on Facebook. Glenn Snidle liked this on Facebook. Satomi Okuda liked this on Facebook. Chuck Pennington liked this on Facebook. Daryl Hardy liked this on Facebook. Ken Kaplan liked this on Facebook. Lisa Day liked this on Facebook. Ricky Williver liked this on Facebook. Steve Yanicak liked this on Facebook. Jeff Lindsey liked this on Facebook. Maurizio Bulgari liked this on Facebook. Daniel Marciano liked this on Facebook. Frank Gentile liked this on Facebook. John Cernak liked this on Facebook. I’ve made my contribution. Have you made yours? Cory Vaughn liked this on Facebook. David C. Evanetz liked this on Facebook. James Abbott liked this on Facebook. Maureen Henderson Pallôt liked this on Facebook. Gary Ellison liked this on Facebook. This style was a re-working from the style of the1890’s or thereabout. 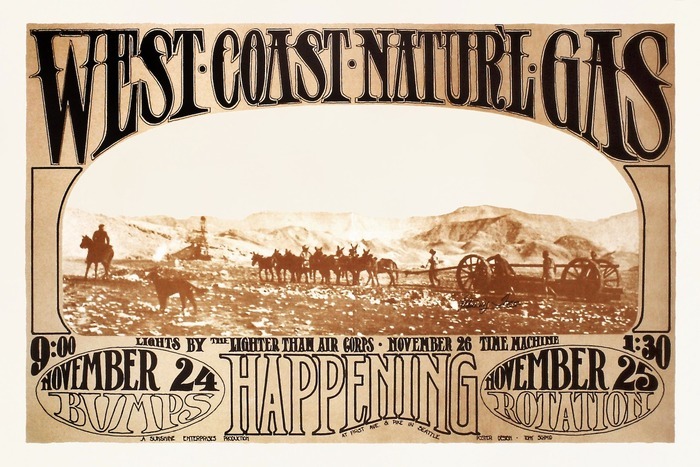 This looks great… When is the SF show this year…or did I miss it again? October 25, 2014 is confirmed at Hall of Flowers! See you there? FuckArt liked this on Facebook. John Hamilton liked this on Facebook. Joe Hammel liked this on Facebook. I’m impressed, you know your art movements! The Vienna Secession is one of my favorites! !